Lamercie Park: The Letter "A"
I found the video clip below online today. I can’t begin to tell you how many times something like this (of course, not this extreme) has happened to me: people who discover I’m a writer and want me to help them get their book published or break into comics or whatever. And they hand me this huge stack to read and call me every day. Last I was told, DC (and perhaps Marvel as well) is no longer looking at pitches or sorting through submissions. The editorial staff meets and decides what new projects they want to do and then they invite select talent (i.e. “names”) to pitch, presumably similar to how feature films are launched. I don’t know much about it, but this sounds incredibly stupid to me. I can rattle off dozens of big-name writers and artists who all got their start by knocking on doors and pitching, something (if I am understanding this new system correctly) which is now frowned upon. Which makes me wonder how many brilliant and exciting new guys and gals are being shut out and how many brilliant new ideas are not being developed at the major houses because now it’s all inbreeding—something it’s been for many years but they’ve perhaps finally institutionalized it. So, I don’t know how to help anybody break into comics. I’ve been trying to break into comics for 35 years. I certainly don’t know how to help anybody get their book published. 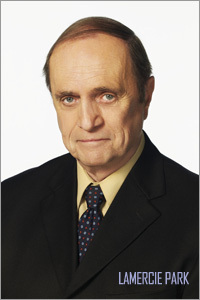 And, like the beleaguered Mr. Newhart, below, I’m often too nice about presenting a realistic picture to people with a dream. Writer's Blok:: I can't begin to tell you how many times I've been through this. How To Break Into Comics: Make friends with somebody in comics. Last week I spent a fairly excruciating hour with a client trying to explain why something I wrote was good and the changes he made to it were not. This is the terror of professional writing: writing for people who are not writers. People who are not writers do not necessarily understand the elements of style or why certain words make certain vibrations when spoken or read one after another. People who are not writers—and I don’t mean that in the sense of being a “professional” writer as I myself am only marginally a “professional” anymore—see only words on a page without understanding the music and poetry that separates imaginative writing from, say, a grocery list. Which inevitably leads to a painful meeting where I’m trying to explain blank verse, meter and style to someone who’d tuned me out at “Good morning…” The most difficult task I’ve consistently undertaken in professional life is explaining to people that writing is hard and not everybody can do it. 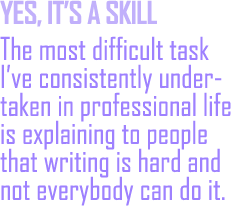 This is because most people who assume writing is easy and/or that they can write just as well as a professional usually do not respect the skill, craft and, yes, art of writing. To these people, it’s all just typing the letter “A.” This extends especially to the comics industry, run mostly by guys who’ve never been a professional writer and whose creative choices often show an alarming lack of respect for writers as professionals and contempt for writing as an art form. Every professional writer has encountered this business of being forced to defend something he or she wrote to a person empowered to change it to whatever they want it to be. The exchange, in this case, was so brutally inelegant that reading it (and being forced to adopt it moving forward as an ongoing theme) makes my head hurt. The client always assumes it’s ego, me defending my precious words. The exact opposite is usually true. People who write for a living are accustomed to abruptly drowning their children—abandoning their best work—because a client is unhappy with it. I never get so married to my own voice that I stop being “professional.” No, I was explaining that what I’d submitted was professional writing, and what he changed it into was not. This required me to not only invest time and energy writing the thing in the first place, but subsequently invest even more time and even more energy defending it. This is what creative services means. First you create it, then you defend it from people incapable of understanding the very explanation they’ve demanded from you. This is the essential premise behind the smash hit Mad Men, where the common wisdom often floated is that the thing that stands between an agency and good work is the client. Back when I was writing comics, I discovered, to my chagrin, that the letter “A” looks exactly the same regardless of who types it. 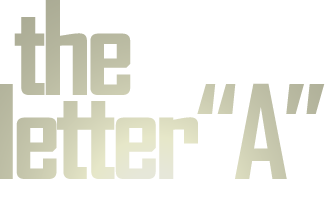 Brilliant writers, hack writers, non-writers: the letter “A” looks precisely the same. I also discovered that people who lack this particular gift of expression also lack much respect for it. Respect, I’ve found, comes in two distinct flavors: (a) the phony respect we offer up to people who pay us and (b) the more difficult kind of respect we show for things that exist in a realm beyond our own ability to comprehend. I have enormous respect for, say, pro golfers and people who paint landscapes. I understand neither discipline. I can be walked out to the water’s edge, beyond which I will happily defer to the experts in these fields. When I fly to New York on business, for example, I usually let the pilot fly the plane. I don’t come up there into the cockpit and start flipping switches. With writing, though, everybody can type the letter “A.” And, rather than me falling in love with my own words, it is usually the client who does that. Why? Because they are usually not professional writers. They sell hair spray and dental floss, which is not to put down people who sell hair spray and dental floss but to point out there is a reason people hire professionals. Every word a client writes is precious and instantly set in fast-hardening cement. It's a little beyond their control: they are not disciplined enough to kill their children the way people who write for a living grow accustomed to. Hiring a professional and then interfering with their efforts to make you richer than you already are is just stupid. I don’t understand people who continue walking past the water’s edge until their hat floats. At the end of the day, it’s all very simple: they don’t know anything about what I do, which is why they hired me to do it. 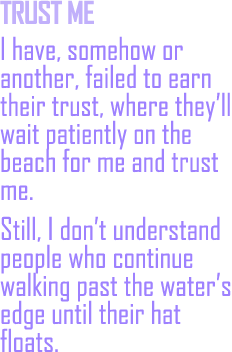 And I have, somehow or another, failed to earn their trust, where they’ll wait patiently on the beach for me and trust me regarding things they simply do not understand. Instead, the golden rule kicks in: he who has the gold makes the rules. The standard becomes I’m Paying For This Therefore I Know Better, a heartbreaking lesson learned several times over in the Mad Men series, where clients turn down amazing and brilliant ideas because they don’t “get” it. This is why I like driving busses. Driving a bus or delivering mail or stocking the shelves at Walmart provides precious rent money so you can be creative without having to put yourself through this. Every person I meet who wants to be a professional writer should understand how not-fun writing for a living can be and often is. Anytime you put your God-given gifts up for sale (or lease), you’re just asking for a headache. Blank verse is poetry written in unrhymed iambic pentameter. It has been described as "probably the most common and influential form that English poetry has taken since the sixteenth century" and Paul Fussell has claimed that "about three-quarters of all English poetry is in blank verse." Iambic pentameter is a commonly used metrical line in traditional verse and verse drama. The term describes the particular rhythm that the words establish in that line. That rhythm is measured in small groups of syllables; these small groups of syllables are called "feet". The word "iambic" describes the type of foot that is used (in English, an unstressed syllable followed by a stressed syllable). The word "pentameter" indicates that a line has five of these "feet." These terms originally applied to the quantitative meter of classical poetry. They were adopted to describe the equivalent meters in English accentual-syllabic verse. Different languages express rhythm in different ways. In Ancient Greek and Latin, the rhythm is created through the alternation of short and long syllables. In English, the rhythm is created through the use of stress, alternating between unstressed and stressed syllables. An English unstressed syllable is equivalent to a classical short syllable, while an English stressed syllable is equivalent to a classical long syllable. When a pair of syllables is arranged as a short followed by a long, or an unstressed followed by a stressed, pattern, that foot is said to be "iambic". The English word "trapeze" is an example of an iambic pair of syllables, since the word is made up of two syllables ("tra—peze") and is pronounced with the stress on the second syllable ("tra—PEZE", rather than "TRA—peze"). Iambic pentameter is a line made up of five such pairs of short/long, or unstressed/stressed, syllables. Iambic rhythms come relatively naturally in English. Iambic pentameter is the most common meter in English poetry; it is used in many of the major English poetic forms, including blank verse, the heroic couplet, and some of the traditional rhymed stanza forms. William Shakespeare used iambic pentameter in his plays and sonnets.